A recent painting by Lebanese-Armenian artist Seta Manoukian depicts a pair of woman’s hands clasped together in prayer, the long, slender fingers interwoven anxiously, desperately imploring a higher power to stop the pain, destruction and sadness. The hands belong to a Syrian friend of the artist and were painted in 2016 in response to the desperate situation in Syria: the deaths of thousands of Syrians, the apocalyptic destruction of Aleppo and other cities, the fleeing of millions of Syrians over the country’s borders to build new lives in often-hostile lands. The artist sets this universal gesture of helplessness and hope against a geometric ground of white and frames it with angular blocks of black, blending artistry and compassion in one powerful image that hints at her own journey through pain and destruction, her own spiritual questioning and searching, and her own liberation through meditation practice and art. When she was 15 years old and living in Beirut, Manoukian remembers experiencing a very strong shift in perspective. She was in the middle of a conversation with a friend when she suddenly became aware of her own body, feelings and gestures and heard her own voice from the outside. She felt completely detached and very light. She had this particular experience only once, but the memory of it remained with her. A few years later, after studying art at the Academia di Belle Arti in Rome, she returned to Beirut and was curious to see if she could access that earlier sensation of lightness again. She stood in front of a mirror and stared for a long time into her own eyes, looking to empty her mind. She began making paintings of her reflection, hoping that this would reveal her inner self. Through this practice of looking inward, she was able to empty herself completely and experience intense light and love, and it was this state from which she created her art. Although she was unaware of it at the time, she was practicing meditation. Today, Seta Manoukian is a Buddhist nun and lives in Hollywood. She left Beirut and moved to Los Angeles in 1985, ten years after the Lebanese Civil War of 1975–90. For at least a decade before she left, she had been enjoying a vibrant career as an artist in Beirut in the 1970s and early 80s. Many of her early works were inward-looking and part of an intensely spiritual process. Paintings of her crumpled bed sheets set against a white wall served as artistic explorations of whiteness and empty space and a personal search for emptiness, silence, and purity within. From these largely horizontal works, images of people began to emerge, and then vertical lines, signifying the artist’s own liberation from anxiety, and consolidation as an artist and as a person. During the war, she was profoundly affected by the death, violence and devastation that she witnessed around her. “I had been experiencing intense light and love for everybody,” she recalls, “and then there was so much death and destruction around me.” She took her newly discovered balance and painted the chaos, pain, and brutality. Many of her images during this period depict people walking in the streets of Beirut, often almost floating in space and wearing ghostlike expressions, or blank faces. Her powerful Hospital series of drawings from the 1970s are intense studies of suffering and despair, again with the bed at the center of the image, again equating the horizontal with suffering and despair. After she moved to Los Angeles, Manoukian’s work moved in many directions, as she explored her own sense of dislocation and instability in a new land. This is what she expresses in her T-Shape painting series (again playing with the uncertain horizontal and the awakened vertical figures), and ideas about nature and life. Symbols of life such as blood and flowers, and of sustenance (water and bread) began to feature prominently in her paintings, conceptual installations and performance pieces. 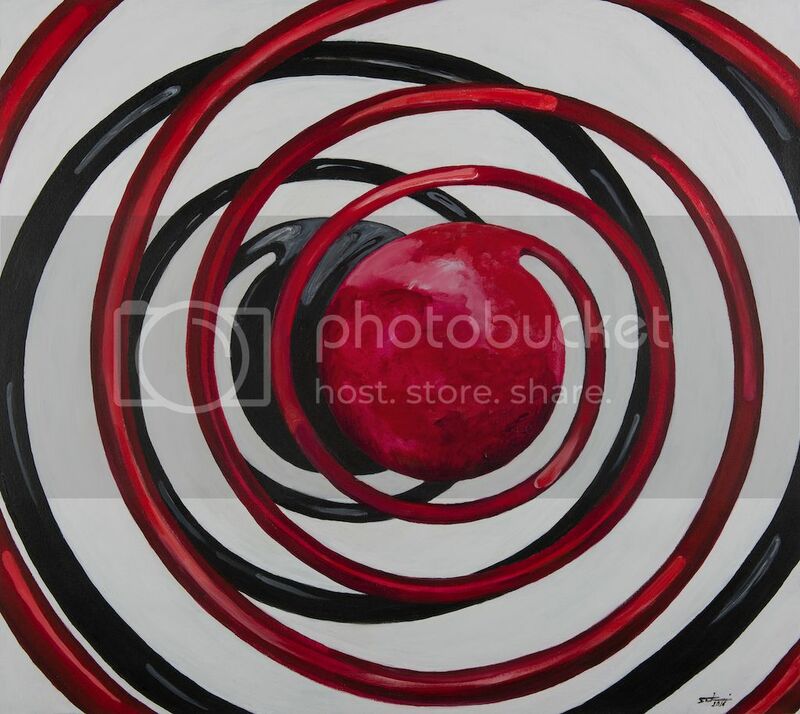 Her series of Boules paintings and installations are deep red spheres with tails – representing life-giving blood – in a dynamic form that evokes the oppositional yet harmonious energy of the Daoist yin-yang symbol. Her own spiritual journey also deepened and she began to practice meditation more formally. In the mid-1990s, she was drawn to Hinduism and the concepts of bhakti (love) and jnana (wisdom or knowledge of total reality) and traveled to India several times. Her 2016 painting Life and Death Dance – which, according the artist “represents perpetual life or perpetual death depending on our perception,” – evokes the Hindu god Shiva depicted as Lord of the Dance, a form in which he is shown destroying and creating the universe. Soon afterwards, she began a serious meditation practice under Bhante Lakkana at LA Buddhist Vihara, a Theravada Buddhist temple in Pasadena, near Los Angeles. After her ordination, she spent almost a year in Sri Lanka before moving to India for a year and a half. On a visit to Los Angeles in 2007, she met Lama Chodak Gyatso Nubpa Rinpoche of the Nyingma tradition of Tibetan Buddhism and decided to study under him. She soon realized that as his disciple, she had a lot to do, practice and learn, so she stopped painting, only picking it up again in 2016 when she felt ready to balance art and spirituality. 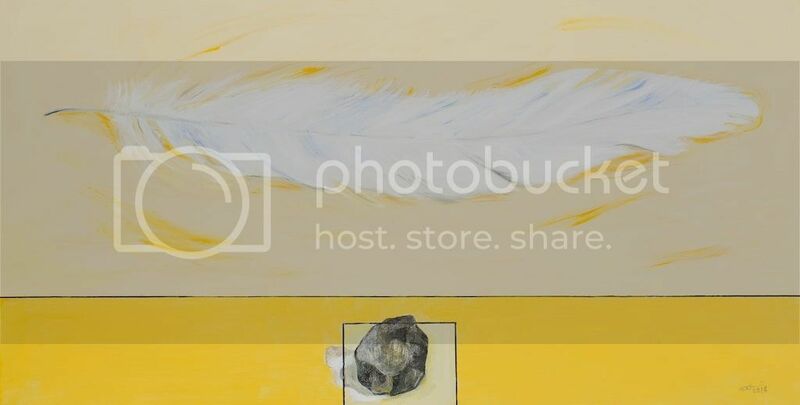 Her return to painting has given rise to some of her most spiritually profound works to date, including her study of rocks wrapped in crumpled paper, seemingly floating in the air, and images of rocks juxtaposed with feathers, also suggesting a lightness in the heaviest of matter and questioning our understanding of the nature of reality. In particular, her series of rose paintings, which she began in 2017, resonate with Buddhist paintings of the Zen, or meditational, tradition. Such images were traditionally created as a focus for meditation practice and typically feature a simple image, abundant white space and a sense of stillness. In these works, she depicts a single rose seemingly floating at the center of a vast ocean of white. Her choice of a rose rather than a lotus—the flower typically used in Buddhist art to represent the potential for enlightenment in all beings—perfectly demonstrates Manoukian’s own personal relationship with meditation, a practice she discovered on her own. To her, the rose represents the female Buddha Tara, a deity who is supremely wise and compassionate. Furthermore, perhaps the choice of a flower that is not only beautiful and fragrant, but also possesses thorns that can inflict pain if we are not careful, is a reminder of the many struggles we face in our spiritual journeys, and the mindfulness we must retain to overcome them. Seta Manoukain’s work is on view at Tufenkian Fine Arts in Glendale, California from April 18 to May 19, 2019. More information can be found here. A documentary film about her ordination as a Buddhist nun is available here.